Easter weekend is coming up fast, which means a bunch of food and chocolate for most people. So why not plan for it and have an ultra healthy lunch or dinner tonight! It only takes 5 minutes to prepare and cook! Amazing and delicious. Plate the organic greens and top with sliced Kiwi, pepper, pumpkin seed oil and goat cheese. In a skillet heat ghee, we prefer using a cast iron skillet. 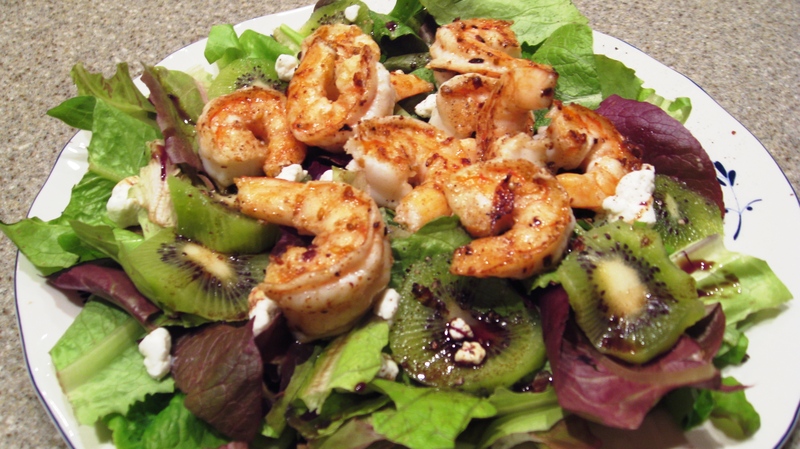 Place shrimp sideways and sprinkle with Thai Spice Blend and sea salt, cook for about 30 seconds, flip and cook for another 30 seconds; place on top of your bed of greens. This beautiful dish is super fast, super easy and super healthy. Have you had a Leek lately? This looks yum! What is the Thai spice blend?